I was tidying up my crafting table this morning, and stood staring at the huge pile of scrap card, and wondered what on earth to do with it. Also on my desk, was a small box of lovely little chocolates (well, you never know when they will come in useful) and an idea limped into my mind. We are coming up to Christmas, there I have said it, and I think it is a lovely idea to have a tiny extra something on the table for each guest to open, and what better than a little chocolate bar? Anyone who knows me knows that I love chocolate and I love books, so I thought that I would make a book containing chocolate and here it is. I have popped the sentiment on the inside, for that extra little something. The card colour is my current favourite Island Indigo, the sentiment is from Label Love and I have used a stamp from Bordering Blooms, which although is not very Christmassy, is an absolutely gorgeous stamp set. To make the book you need two pieces of card. 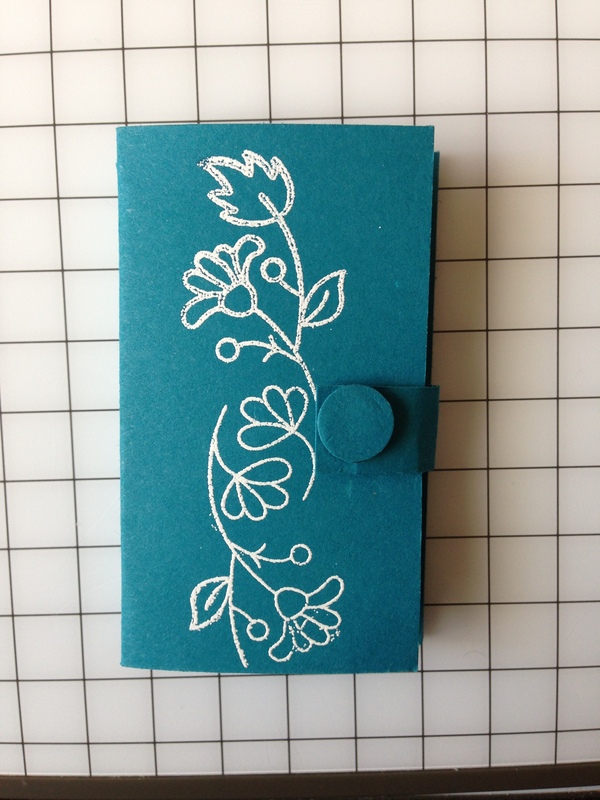 One measuring 5 x 8 cm for the inside box and a piece 9 x 7cm for the cover. Score the 5 x 8cm piece at a centimetre on all sides. Score the other piece on the long side 4 and 5 cm. If you want to decorate the front and back of the cover do this before scoring. To make the box for the inside make two cuts on short side at one edge of the tiny boxes created by the score lines. Then put a glue dot on the outside of the tiny squares so that they stick on the inside of the box. 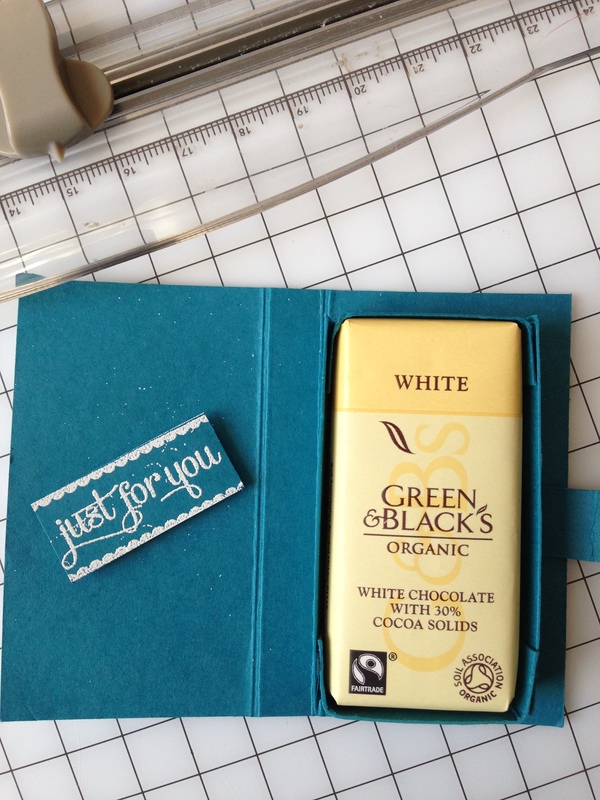 You need a tight-fitting box to ensure that the chocolate stays in place. Place strong glue on the base of the box (I used Tombo to give me some wiggle room) and make sure the box is lined up against the score mark and equidistant from the top and bottom edges. If you want to keep the book closed use a strip of card glued under the inner box, and add a couple of magnets. This is such a simple project and would very easy to resize for a full sized bar, and is a great way to use up the scraps that you have lying around. Just remember that you need a little overhang. If you want to order any of the bits I have used, or have any questions please do not hesitate to contact me. great idea – love it and will definitely be making some of these!